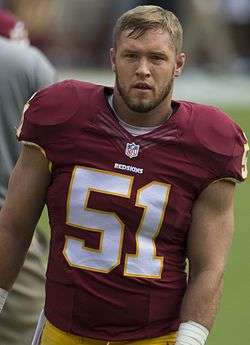 William Compton (born September 19, 1989) is an American football inside linebacker for the Washington Redskins of the National Football League (NFL). He played college football at the University of Nebraska–Lincoln. He joined the team as an undrafted free agent during the 2013 offseason. As a football player for North County High School, Compton played as a linebacker and a wide receiver. A first-team all-state selection, Compton was listed as one of the top five players entering college from Missouri high schools. He went to the University of Nebraska, where he was redshirted in 2008. He won a starting position with the team the next year. Compton was a three-time Academic All-Big Ten selection, and he was team captain as a senior in 2012. The Washington Redskins signed Compton as an undrafted free agent on May 2, 2013. He was released during final cuts, but signed to the practice squad a few days later. On December 24, Compton was promoted to the active roster in place of Nick Barnett. After the 2014 preseason, Compton remained on the active 53-man roster as a reserve inside linebacker. In Week 6 against the Arizona Cardinals, he made his first career start in place of an injured Perry Riley. Originally beginning the 2015 season as a reserve inside linebacker, Compton filled in as a starter for an injured Keenan Robinson. Head coach Jay Gruden announced that Compton "cemented a role as a starter on this football team based on his play.” He recorded his first career interception on quarterback Kellen Moore in last game of the regular season against the Dallas Cowboys. Due to starting ten games, he earned a $222,465.82 bonus. On March 4, 2016, the Redskins extended a tender to Compton. He officially accepted and signed the tender on April 19. ↑ "Will Compton". Huskers.com. Retrieved October 30, 2016. ↑ Tinsman, Brian (May 2, 2013). "Redskins Sign 12 College Free Agents". Redskins.com. Retrieved 2013-10-13. ↑ Jones, Mike (August 31, 2013). "Redskins cuts: Tony Pashos, DeJon Gomes, Chase Minnifield among them". WashingtonPost.com. Retrieved 2013-08-31. ↑ Jones, Mike (September 1, 2013). "Chase Minnifield, seven others signed to Redskins' practice squad". WashingtonPost.com. Retrieved 2013-09-02. ↑ Tinsman, Brian (December 24, 2013). "Redskins Revamp Linebacker Corps". Redskins.com. Retrieved 2013-12-26. ↑ Jones, Mike (October 16, 2014). "Will Compton aims to build on first start at inside linebacker". WashingtonPost.com. Retrieved 2015-04-15. ↑ Czarda, Stephen (December 16, 2015). "Will Compton Has Come A Long Way For Redskins". Redskins.com. Retrieved March 15, 2016. ↑ Gulizia, Anthony (November 13, 2015). "Inside linebacker Will Compton earns start with smart, physical play". WashingtonTimes.com. Retrieved March 15, 2016. ↑ "Redskins-Cowboys Monday Stats Pack". Redskins.com. January 4, 2016. Retrieved May 17, 2016. ↑ Keim, John (March 14, 2016). "Will Compton among four Redskins to earn another $200K for 2015 season". ESPN.com. Retrieved March 15, 2016. ↑ Walker, Andrew (March 4, 2016). "Report: Redskins Extend Tenders To Compton, Thompson, Way". Redskins.com. Retrieved March 6, 2016. ↑ Czarda, Stephen (April 19, 2016). "Linebacker Will Compton Says He's Signed His Tender". Redskins.com. Retrieved May 17, 2016.